Since 2000, we have developed many HIPAA compliant healthcare solutions; Serving as Business Associate to many healthcare software vendors and covered entities. Technosoft has been involved with major healthcare software providers to make their solutions HIPAA compliant since early 2000. We have senior HIMSS Certified Healthcare Security Professionals in our staff. We have intimate knowledge of HIPAA privacy and security regulations and its local implementations/interpretations. How q uickly we can help? We have pre-developed many software frameworks that help us quickly deliver a HIPAA compliant solution. All our healthcare software goes through a rigorous HIPAA checklist. We have HIPAA policies implemented throughout our organization and we will be glad to sign a HIPAA Business Associate Agreement for software development or support service contracts. 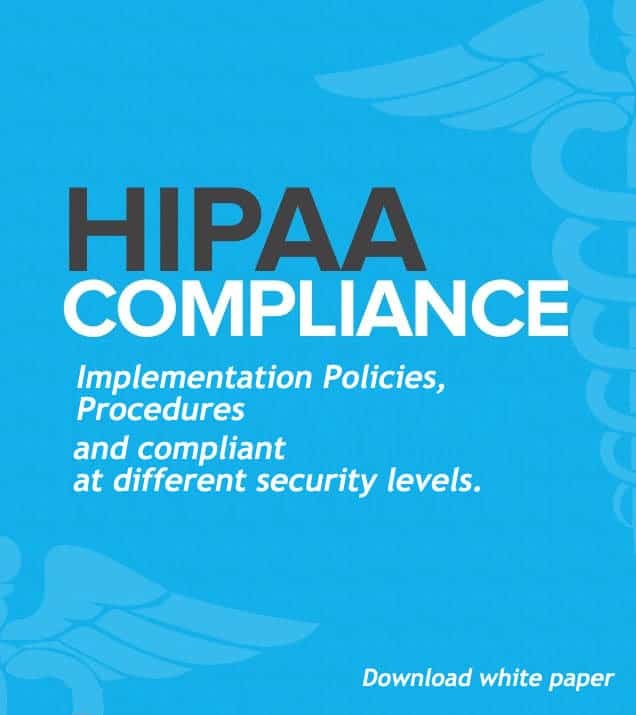 HIPAA implementation Policies Procedures and compliance at different security levels. Engage with our business and technology experts for strategic solutions that address the full scope of healthcare issues today, from compliance through integrated health management. Contact us at info@techno-soft.com or call 203-676-8299.